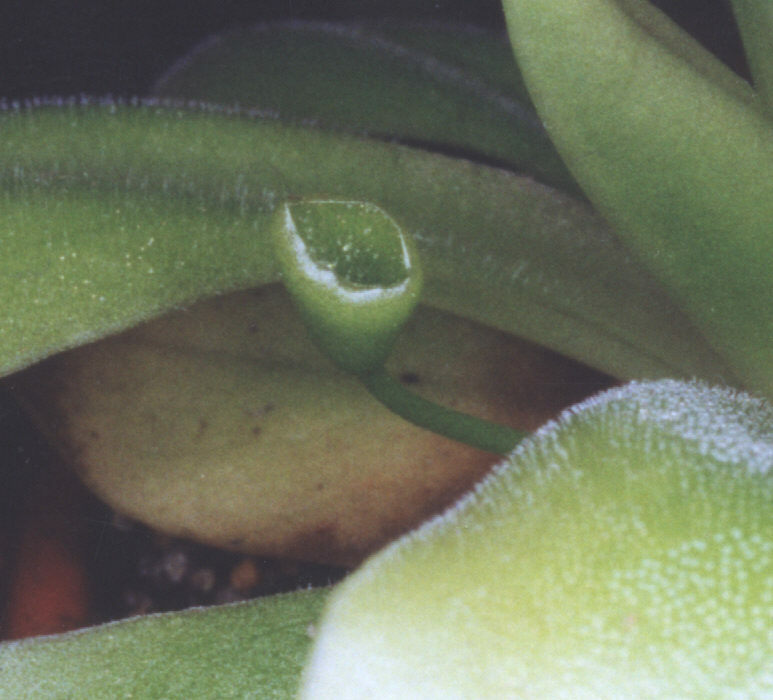 Pinguicula moranensis with a strange pitcher shape leaf on an aborted flower stalk. So, flower or leaf ? 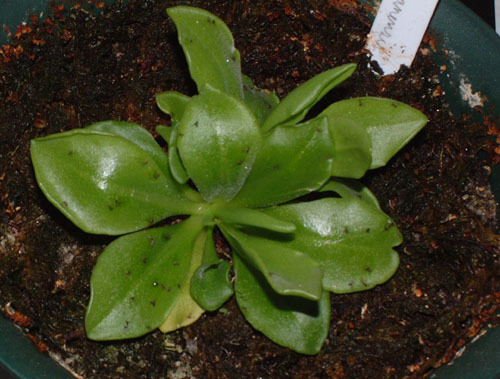 This is a rare form of Pinguicula alpina 'green leaves' with at a distancy only of 5 cm, a Pinguicula alpina totally red. 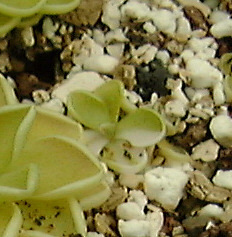 The two plants were in full sun !. This is a wall of an old middle-age castle. 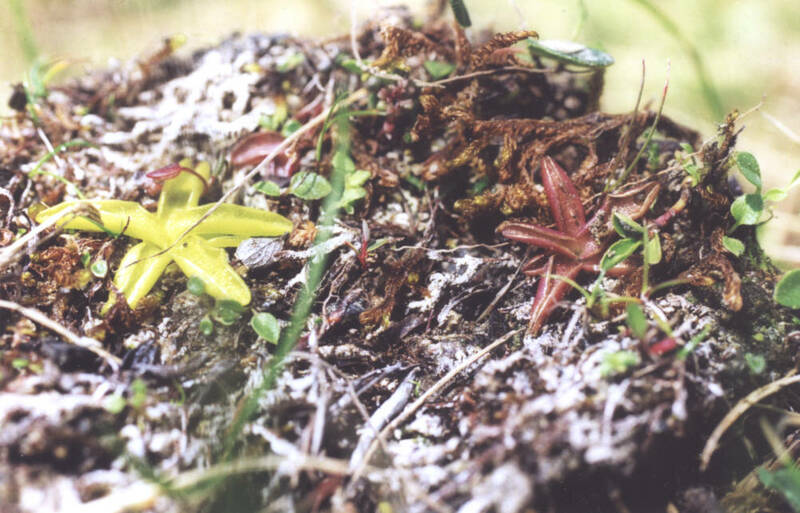 The yellow blotches are Pinguicula vulgaris. 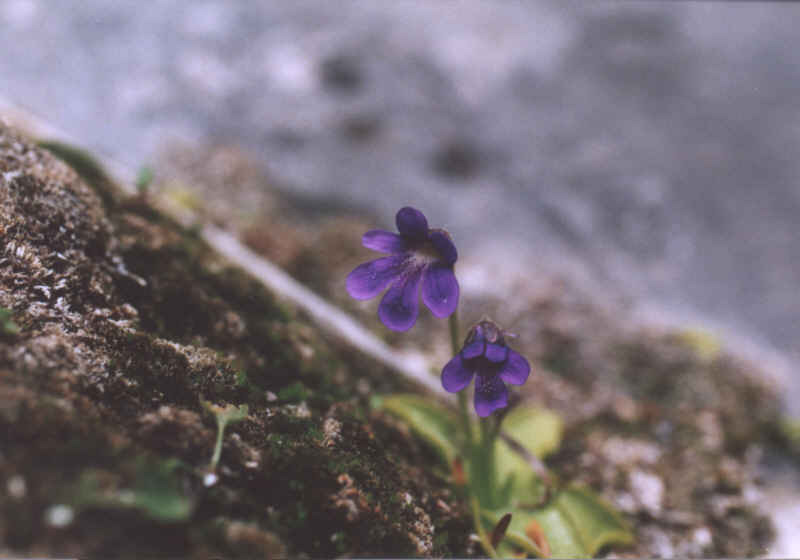 Is it a middle age form ? 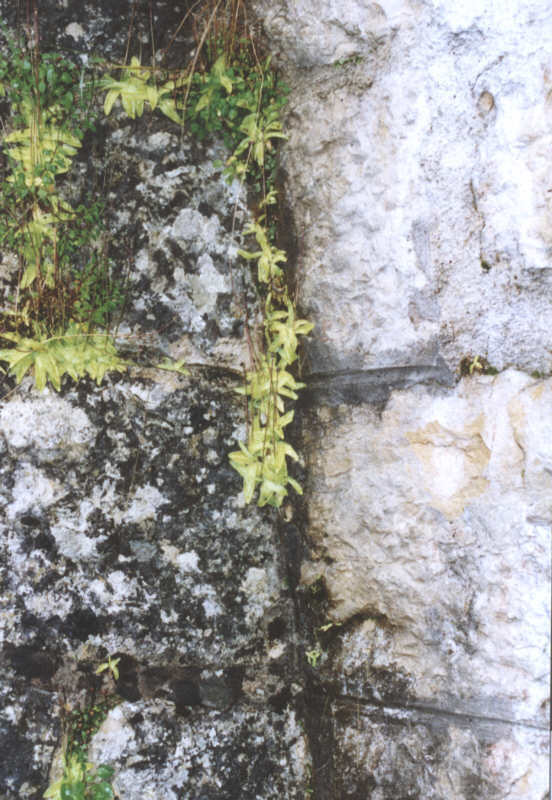 The plants are growing between the rocks. 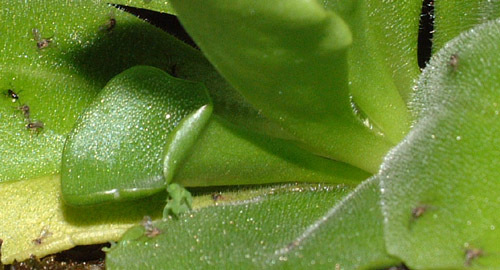 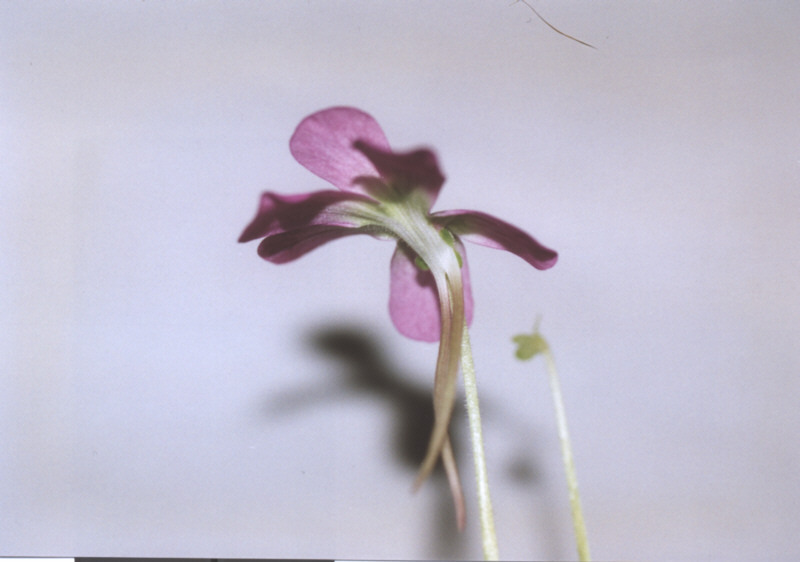 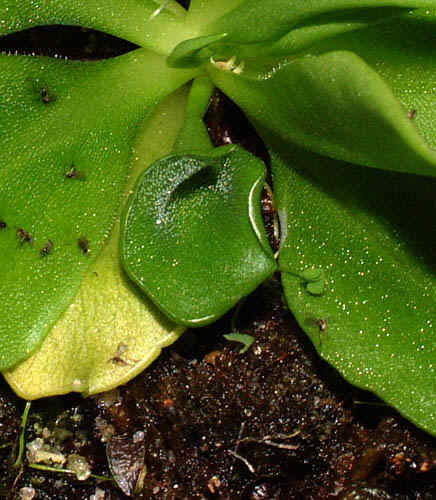 There are no Pinguicula vulgaris locations around (nearest at 25km). 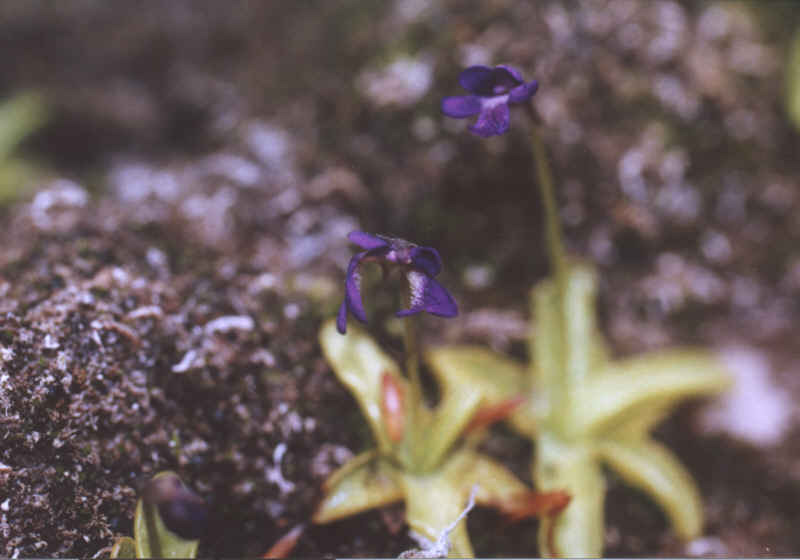 How does this population succeeded in climbing here ? 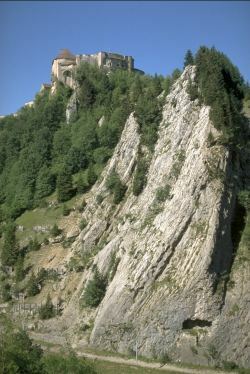 If you don't believe me,have a look on the following picture of the castle ! 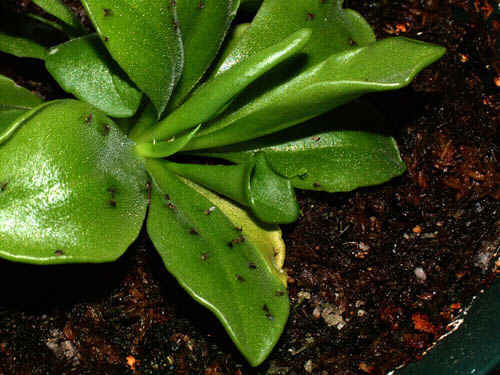 Impressive location, isn't it ?
" 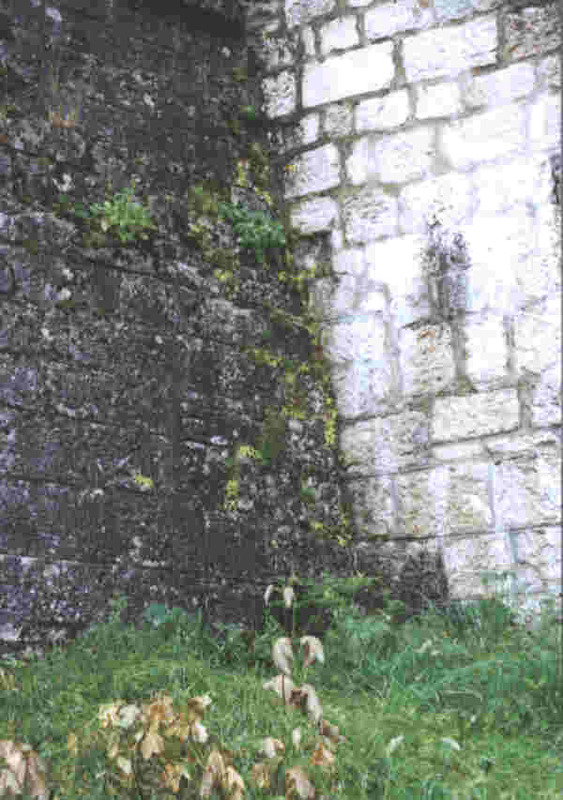 I've an hypotesis about your photo of P.vulgaris in a castle's wall: I read somewhere that P.vulgaris was used in the past centuries to curdle the milk to create cheese (I don't know what regions had this acient tradition), so maybe some people of the castle had collected plants with mature seed pods." 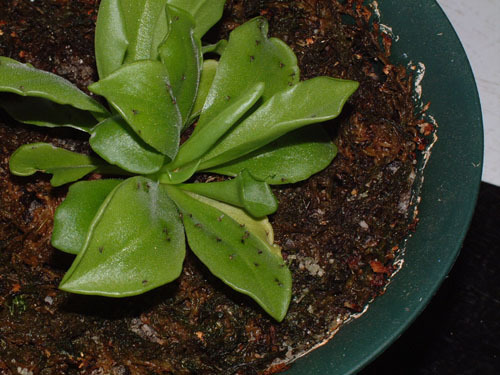 Pinguicula moranensis with a strange pitcher shape leaf. 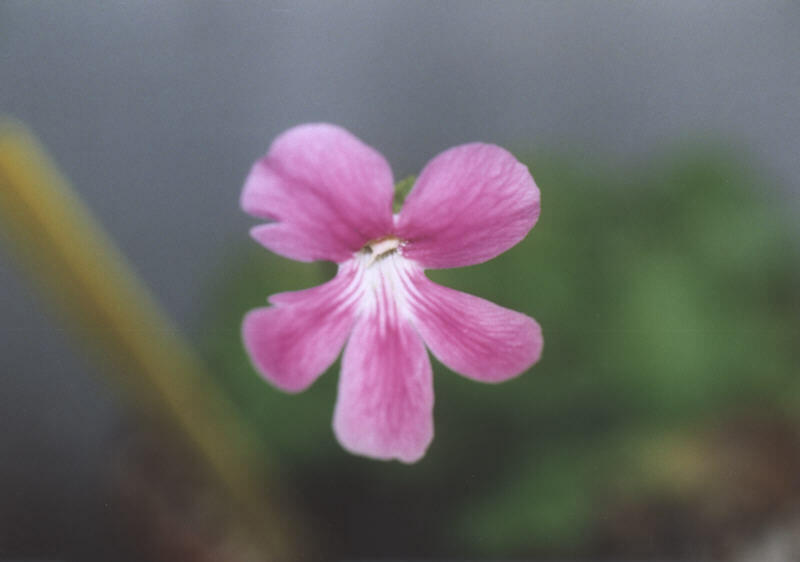 it in a tall, undrained, pot in an open soil mix and placed it in an East-facing window. 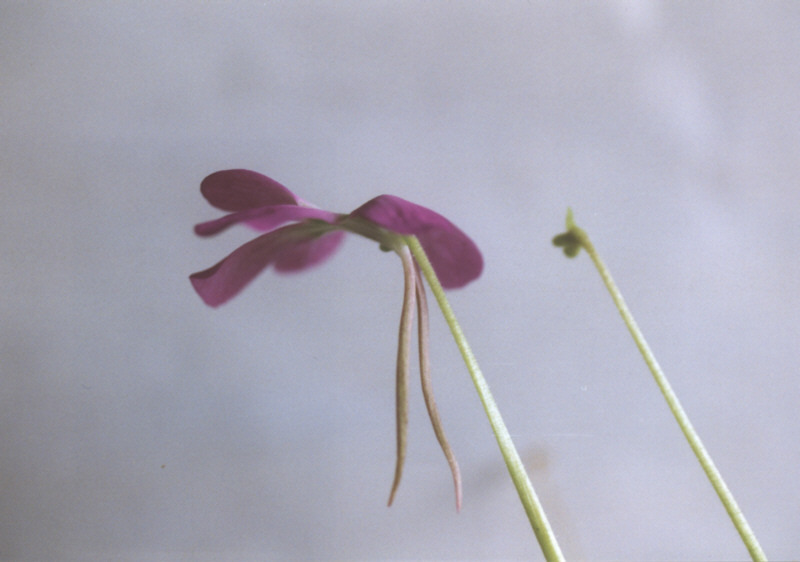 Changing circumstances forced me to move it to a much less sunny West-facing window in late September 2002. I noticed this strange leaf after accidentally allowing the pot to dry out almost completely. 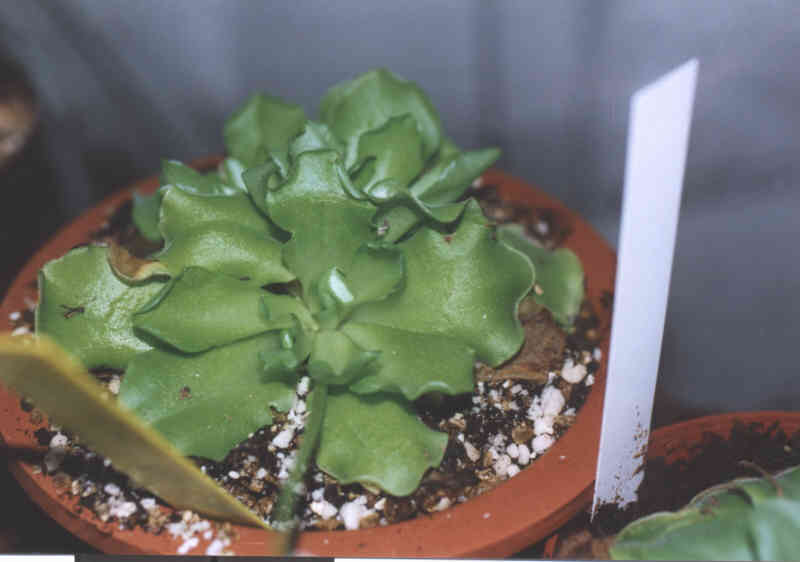 The growth crowns of both of these plants are dividing. 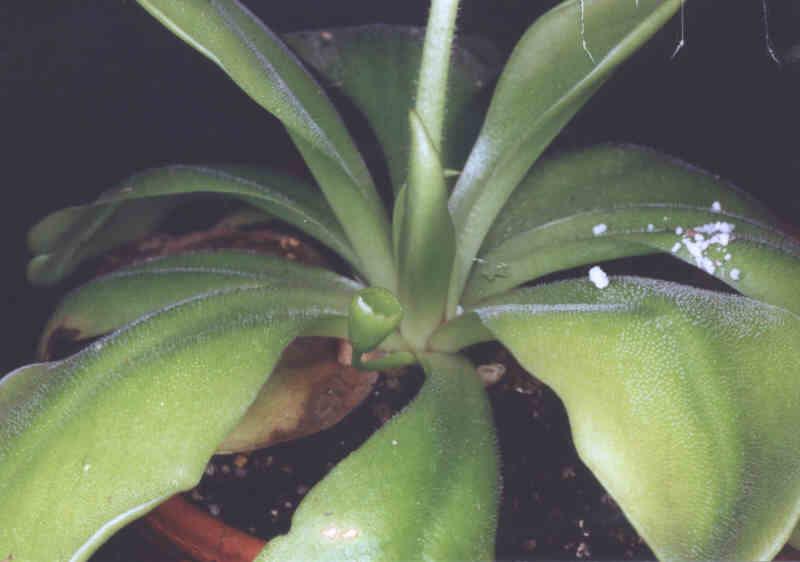 It's worth noting that the other plant, which has been in the West-facing window and watered on the tray method, appears to be almost perfectly normal. 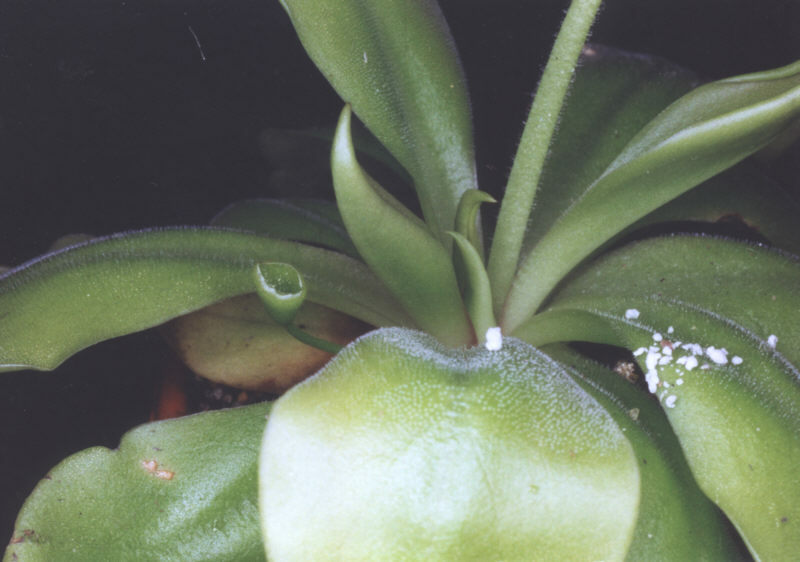 A strange Pinguicula jaumavensis with bicolored leaves. 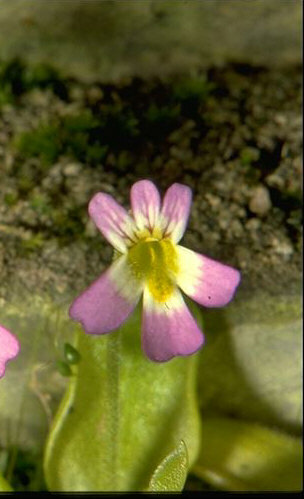 Pinguicula crystallina subsp. 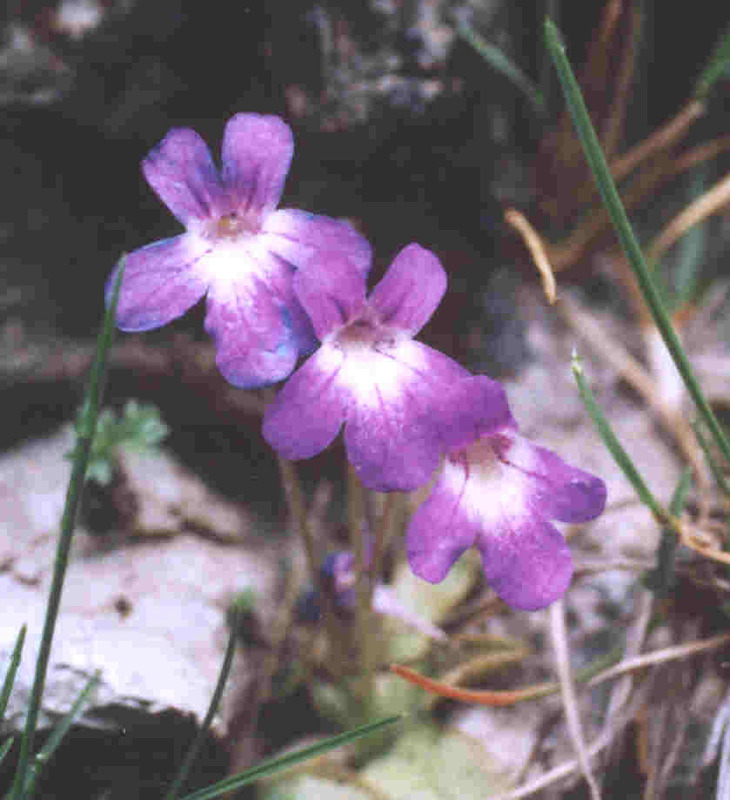 hirtiflora with three upper lobes.